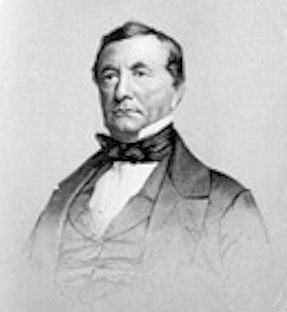 The fifth Mayor, William Wright, was born in Rockland County, New York, and after being engaged for some time in the saddlery hardware business in Bridgeport, Conn., removed to Newark. He built up a fine business in Saddlery hardware manufacture, and retired, after thrifty years, about 1854, then being a little over sixty. He served three consecutive terms as Mayor, at the height of his business career. While in his second term he was elected as representative to Congress. He was re-elected in 1844, and three years later was candidate for Governor, but was defeated by Daniel Haines. He was at first a Whig and an ardent supporter of Henry Clay in 1848, but two years later he went over to Democracy, and in 1853 was elected United States Senator by that party. he was defeated by a representative of the then new Republican party at the expiration of his first term, but in 1863 was returned to the Senate. He died in 1866 at the age of seventy-six. He was deeply interested in Newark's advancement and did much for the development of its industries. There is a tablet to his memory in the House of Prayer. He was interred in Mount Pleasant Cemetery in Newark.